Smuggling and trafficking in persons is ipso facto illegal. Is this criminal activity organised or diffuse? Recent objective indicators show that between 2000-2005 the reported incidence of people trafficking and smuggling from North Africa to Europe has escalated. 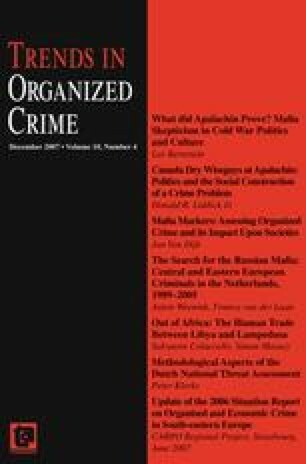 The article examines the nature of criminality involved in people smuggling and trafficking with specific reference to the sea route between Libya and the Italian island of Lampedusa, 180 miles north of the Libyan coast. In 2006 almost 19,000 illegal migrants arrived on this small island. Recent major operations conducted by the Italian anti-mafia unit and the state police suggest transnational criminal organisation of the trade. The networks involved in this trade, however, do not conform to mafia-like hierarchical organisations but rather smaller, more complex and fluid criminal networks. The article aims to cast light on how people are smuggled and trafficked. The background to the rise in illegal immigration from Libya is sketched underlining the ‘push’ and ‘pull’ factors involved in the human trade. The article’s chief objective is to provide a greater understanding of the mechanisms and processes involved in smuggling/trafficking. A better knowledge of the processes involved is vital if domestic, regional and international authorities and bodies are to counter the practice and/or to formalise it.